This is an awesome book! The story line is simple. A group of mice see a postcard from a museum advertising their new sculpture exhibit and go visit. The mice are then inspired to create their own drawings and sculptures of their own. I picked this book up randomly off the new books shelf at my library and I am so happy I did. It introduces my son (and me) to different types of sculptures in an entertaining way. We’ve read this book about 10 times now and every time we’ve read it he asks for me to read it through two or three times — so we’ve read it maybe 20/30 times at this point. After our most recent reading of this book my son asked,”Can we make sculpture?” I was so surprised and happy he asked me this! I pulled out the beeswax and we set the book up on the kitchen table. We both played with the beeswax and he started stacking some of the shapes he had created on top of each other. I said, “Very nice!” I was most impressed with his sculpture. I just imitated the sculpture that was on the cover of the book (not very creative of me, but I’ll try to mend my ways). When I set up my beeswax sculpture he said,”Mama, you made a sculpture!” He was very excited. This event then digressed (progressed?) into him asking me to make various trucks and other vehicles out of the beeswax. I grabbed our copy of Trucks Go! and did my best to imitate the trucks that I saw in the book. Anyway, both reading the book, discussing the book with him, and then playing with the beeswax afterwards was a lot of fun. Go read this book and be ready to make sculptures with your kiddo afterwards. So much fun! 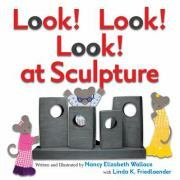 Nancy Elizabeth Wallace and Linda K. Friedlaender have also collaborated on another book called Look! Look! Look! and I’m really looking forward to reading it with my son. I’ll be going to Nancy Elizabeth wallaces website here and checking out the different activities she has. Who knows what else it might inspire? It was a lot of fun sculpting with my son. This book was such a pleasant surprise!